If you could predict the future, your knowledge of the stock market would make you very wealthy. Of course, no one can predict the future with absolute accuracy – but active management uses historical information and in-depth market intelligence to help investment managers determine when to buy and when to sell. History doesn’t always repeat itself, of course, but why remain heavily invested when all signs point to a falling market? Active management provides a way to potentially avoid large market losses, while still benefiting from market gains. While past performance does not guarantee future results, active management has the potential to significantly reduce your investment risk and increase your long-term gains. We may not know how the market will perform on any given day, but we do know how it has historically reacted to changes in factors such as corporate profits, interest rates, inflation, unemployment and other variables. Active management uses sophisticated technology and economic data to identity the impact of these variables. Using proprietary models based on these factors, we can generate “alerts” and “stops” that signal when it is time to buy or sell. Based on this information, we can determine whether investors should be heavily invested in the market – or whether they should temporarily pull their money out of the market. While history doesn’t always repeat itself, it is the best predictor we have of how the market will act. When a model’s market indicators signal that it is time to sell an investment because of the potential for losses, funds are shifted to money market funds, or other cash or fixed-income investments. When indicators signal the potential for significant gains, funds are re-invested in stocks, mutual funds, exchange-traded funds or other equity investments. How will missing a bear market affect my portfolio? 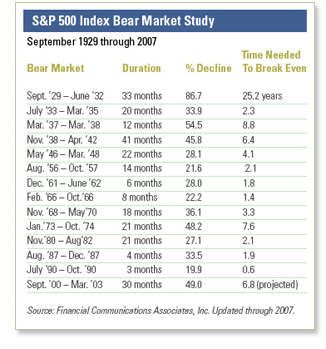 There were 14 bear markets between 1929 and 2007, during which the market fell by at least 20%. In many cases, the market fell by much more than 20%. In the 1929 crash, it fell by 86.7% and at the beginning of the current decade, it fell by 49%. Omitting the 1929 crash, it has taken an average of 3.6 years of gains to reach breakeven. Remember that if a portfolio loses 50% of its value, it must grow by 100% to make back the loss. How does active management differ from market timing? Market timing is a very short-term strategy in which the investor trades from day-to-day based on presumptions about what the market will do on that day. Active management is based on longer term market trends. How is active management viewed on Wall Street? Traders on Wall Street have long used sophisticated systems to help them identify the most appropriate times to buy and sell. “Program trading” was criticized as a system that helped the rich get richer, as it was unavailable to the average investor. Today, investment managers with the appropriate trading systems can help their clients by alerting themselves when heavy buying or selling of a stock takes place, or when other critical changes in the market occur. Does active management depend on technical analysis of the stock market? Active management typically incorporates both fundamental and technical stock analysis. After all, the more market knowledge that goes into an investment decision, the better. If active management is so effective, why don’t more investment managers use it? Active management requires special knowledge that many investment managers and financial advisors lack. It also requires an extensive time commitment and dedication to trading. Those that follow a “buy-and-hold” strategy can spend more time selling to new clients. And, since a “buy-and-hold” strategy is widely accepted, they have less of a challenge educating clients about their approach to investing. Since investment managers sell during bear markets, they can greatly reduce risk for investors.